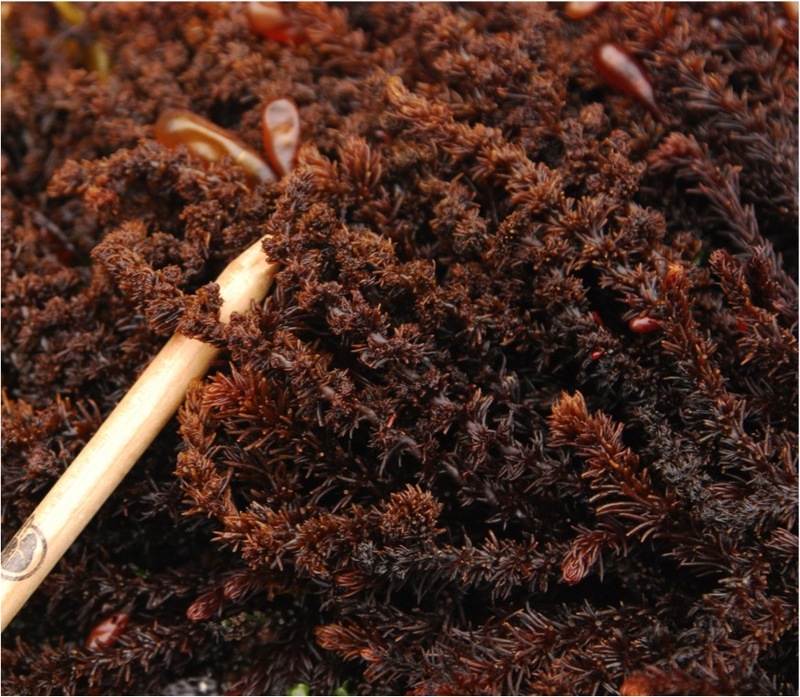 Black pine is a red seaweed that looks somewhat like the branches of larch trees. Its small, wiry branches are circled with clusters of stiff branchlets that give the species a knobbly appearance. The main branches are unbranched or branch only a few times, and grow to 20 cm long. The branchlets are only about 1 cm long. It is usually blackish-brown in colour, though will gain light patches towards the end of the growing season. 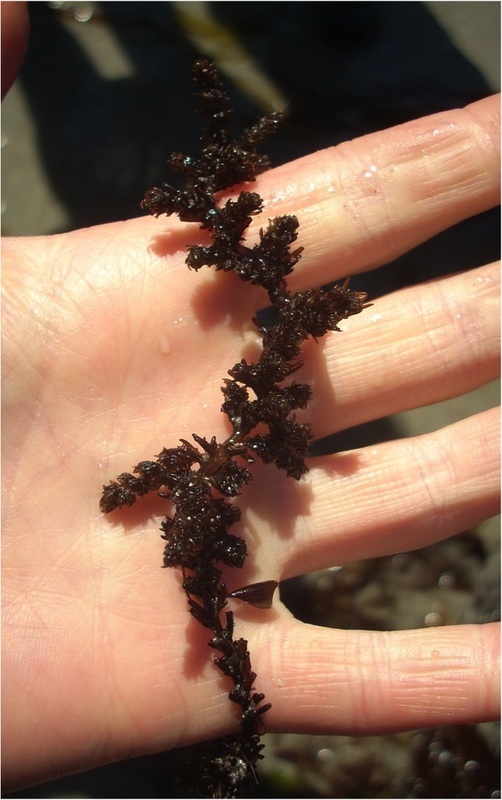 Black pine tends to form large, dense mats spread over exposed rocky shores in the low to mid intertidal. Its range extends from the Bering Sea to Baja California. It also grows along the coasts of Japan and Russia. The other species of the same genus commonly found in coastal BC waters is Oregon pine (Neorhodomela oregona). While it is similar to black pine, the two are not difficult to tell apart. Black pine is stiffer and coarser than Oregon pine, and branches less frequently. Oregon pine also has branchlets, but they are not bunched together like those of black pine, so the appearance is less knobbly. Other similar species include graceful black pine (N. aculeata), sea brush (Odonthalia floccosa), and bleached brunette (Cryptosiphonia woodii). Black pine contains some herbivore-deterring compounds (bromophenols). Harbo, R. M. (1999). Whelks to whales: Coastal marine life of the Pacific Northwest. Madeira Park, BC: Harbour Publishing. P. 209. O'Clair, R. and Lindstrom, S. Neorhodomela larix (Turner) Masuda. In Klinkenberg, Brian. (Ed.). E-Flora BC: Electronic Atlas of the Plants of British Columbia. Lab for Advanced Spatial Analysis, Department of Geography, University of British Columbia, Vancouver. Accessed 22/08/2013.